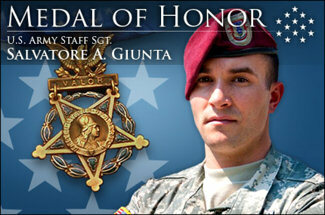 On November 16th, I was fortunate to watch in real time President Obama present Army Staff Sergeant Salvatore Giunta, the Medal of Honor for conspicuous gallantry for his courageous actions against an armed enemy in the Korengal Valley of Afghanistan in October 2007. And while it is sad knowing that Salvatore Giunta's fellow Medal of Honor brothers of Operations Iraqi Freedom and Enduring Freedom made the ultimate sacrifice, it was special and very moving to see the first living servicemember receive the MOH since the Vietnam War . . . Like he was there for all of them . . . who can go forward representing them all, as has his older fellow Medal of Honor recipients continue to do since their war days over 40 years ago. Every American from elementary students to those of our greatest generation should take the time to experience Staff Sergeant Salvatore Giunta receiving the Medal of Honor . . . as it is one of the rarest ceremonies honoring a "great living hero". It should be a must in every history class too along with seeing Salvatore Giunta talking about his "Medal of Honor" actions and fellow soldiers in his unit expressing their thoughts about him. Each one should come away with a feeling of pride and sincere gratitude for his heroics with similar thoughts for all our valiant troops... especially for those serving in harm's way. I even wrote a new poem, A Hero - Just Doing His Job, honoring Army Staff Sergeant Salvatore Giunta for his remarkable heroism . . . and being a shinning example to all Americans. May America's newest great military hero live a long blessed life!